Fixing Grace : When to Replace Your Furnace. When to Replace Your Furnace. Furnaces are called durable goods for a reason; because they hopefully will last for a few years. Typically, the homeowners expect them to last between 30 and 40 years, but the truth is that a furnace will wear out between 10 and 15 years. Just because your furnace is still "running" at two and a half decades doesn't mean that you've beaten the odds. What it really means is that you're heating your home with a ticking time bomb. The picture on the left is out of a 25 year old furnace and the center should tell it all. 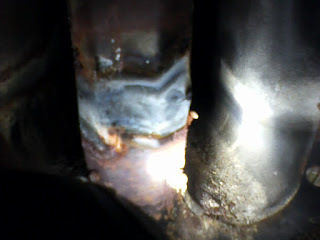 The front of the heat exchanger is cracked and said crack has begun to open up. Although the carbon monoxide readings were zip, zero, zilch, this was still dangerous because of the potential for this gas to end up in the living space. In this picture, with the burners on you clearly see where the flames touch the crack and could direct gases inside. Last April, I had to replace my furnace over a blow out in the heat exchanger, even though the carbon monoxide readings were zip, zero, zilch. The customer wanted to know if we could solder or weld the crack, but this is against the law to do and contraindicated. Once the heat exchanger is cracked or compromised, the heating contractor HAS TO SHUT IT DOWN. Rust is another huge problem with older and even some newer units that have been exposed to moisture, deferred maintenance or even poor installation practices. 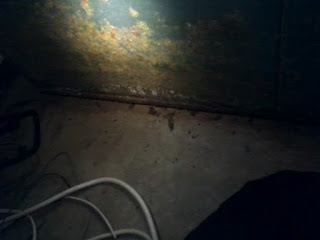 The unit below is less than seven years old and a condensing furnace. This means that water has to drain because the exhaust doesn't get hot enough to vent it out the chimney. 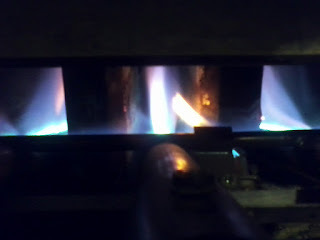 The furnace had never had any maintenance done prior to this or this would have been discovered a lot sooner. 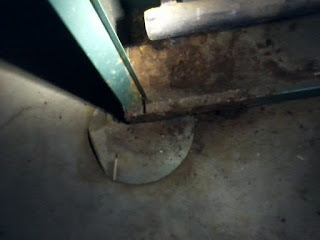 Apparently, the installer hadn't secured a clamp to the drain hose below that plastic elbow and water had gotten past it. the result was a rusted clamp, and a potential for the partition between the blower (living space) and the seal burner compartment to perforate. This would have created a potential for combustion gases to enter the living space. Probably more an argument for maintenance than replacement, it still stresses the need to find these problems before the damage becomes an ultimate issue. This is death or injury to the customer and others in the living space. 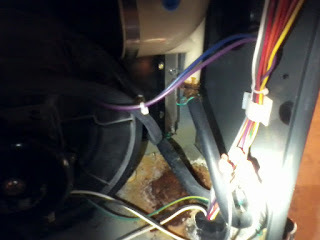 More common is the older furnace with a corrosion problem. Basements tend to be wet and lack ventilation, so the humidity is going to be higher. If you live next to an ocean, or the rust belt, you realize that cars and trucks are going to rust out and so most tend to replace them. In fact it's the body and not the mechanicals on a vehicle that deteriorate it to the point that it's no longer safe to drive. I owned a car that literally broke in half in front of the police station because of this, and I had continual problems with exhaust gases getting inside the trunk and the car because of the rust holes. Many of us drive cars with rust, but this still doesn't make it right, because these can cause safety problems sooner or later, but I digress. Furnaces are no different and any loss of structural integrity will make them unsafe. Cabinets can and do collapse and cause electrical shorts and fires, but the more likely scenario is that the blower compartment will perforate and allow gases to seep in, asphyxiating the people in the house. I saw this furnace, an accident waiting to happen with a bottom with no structural integrity whatsoever. Regrettably, the picture to the inside got lost, but the bottom was perforated to the point you could put a finger through it like a needle going through cloth. I declined to perform maintenance on this gem because of the liability involved. I could have ripped the bottom out with my bare hands and even a misplaced tool could have opened it up. Like the heat exchanger, there's no good fix for excessive rust other than replacement. Car owners will frequently replace rusted panels on a car, but this isn't practical to do on a furnace and could expose anyone performing this to liability. By the time a panel is fully rusted, the rest of the structure is also involved. You can paint over it or use a treatment, but for the most part the rust will return. I've done and seen enough bodywork done that confirms this. Even taking it down to bare, undamaged metal is not going to cure it. Again, this is done on cars, but the process is still expensive and time consuming. This is why classic cars are so expensive too, because of the work involved. Unlike cars, furnaces do not appreciate in value and in fact are valueless the moment you cut the side out to put in the return. I've been to a lot of houses and seen fewer and fewer people driving 20 year old cars or watching 20 year old TVs (I've seen VERY few TVs over 3 or 4 years old in fact, most are in the trash). Most of us have the latest computers, kitchen appliances etc, but few of us pay much attention to the time bombs in our basements, mechanical rooms, attics, etc. Not only are your utility bills higher than they should be, the health risks to you and your family are there every time you switch on the thermostat. Maranatha! Dysfunctional Driving: Headlight Flashing Fix.